Acclaimed singer and civil rights leader Paul Robeson spent a lifetime fighting racial discrimination, and he developed a deep connection to the National Maritime Union’s fight to integrate America’s ships. Listen to this story about Robeson experiencing discrimination on a ship in the late 1930s. Founded in 1937, the National Maritime Union broke the color line in American shipping. Prior to their arrival, conditions for seamen were desperate—as illustrated by the extraordinary graphic art in our “Why Unions” exhibit. The NMU won African American seamen the right to work above deck and in the engine room, even as the union won vastly improved living and working conditions for all seamen. Robeson signed on as an honorary member, and raised his extraordinary voice in support of their fight for equal rights. This exhibit is part two of a series of four exhibits honoring the 75th anniversary of the NMU. Part three tells the story of the long strike in 1936 that led to the founding of the NMU, and part four gives you audio from Woody Guthrie, a tall tale about Woody to be read aloud, and recollections from veteran seamen. 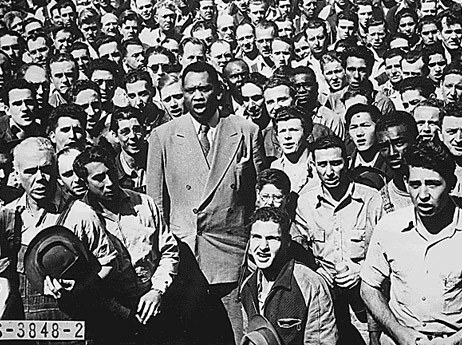 Paul Robeson leading shipyard workers in singing the “The Star Spangled Banner” in Oakland, California, 1942. ~ Photo courtesy of the National Archives (ARC Identifier 535874).